To the sick and troubled: Jesus wanted to be close to us also in his own pain and suffering. He's close to you. He said. "If you find a sick person, you find me." He's here with the sick and those with problems. When we suffer or have problems, it's hard to understand, but it's a question of feeling Jesus' consoling caress, not understanding. To children and young people: Don't become strangers to parish life and to the life of faith. Don't make Confirmation the "see you later" Sacrament; the Lord has chosen you to make a community. Sometimes my faith dropped so much that I couldn't find it and lived as if I had none. Then you find it again. Life's ups and downs can shock you and move you to lose some faith; then you find it again. Jesus told the sick child's father, "Everything is possible for the one who has faith"; he replied, "Lord, I believe; help my unbelief." There are dark days; I've had them too. Don't be afraid: pray and be patient, and the Lord will show up and make you grow in faith and go forward. A man who lost his wife in the recent earthquakes told me, "I lost my love." Can he have faith in this dark moment? You don't tell him to have faith; just shut up, accompany him, respect his darkness, and the Lord will awaken his faith. Faith is God's gift; our job is only to preserve it. To parents of recently baptized children: Don't fight in front of the children. Arguing is part of life, but don't let your kids hear or see you fight. If you need to, go to the other room, close the door, and have it out. Blowing off steam is healthy, but don't let them see it, because they'd feel abandoned and suffer. And don't go to sleep without making peace; avoid a dangerous ‘cold war’ the next day. At Mass: Avoid gossip. The Apostles didn't speak ill of each other or of others; they didn’t talk behind each other’s’ backs. They did other bad things like betraying the Lord, but not that. We're all sinners, but a community with gossips and trash-talkers can't give witness. Heb 5:1-10 High priests are men made representatives before God; they can deal patiently with us because they're beset by weakness. Christ was made high priest: he offered prayers and was heard; he learned obedience from suffering and became the source of salvation for all who obey him. Ps 110:1-4 "You are a priest for ever, in the line of Melchizedek." Creighton: In the Old Testament, fasting was voluntary during times of stress or trauma. Jesus reminds his followers that his presence should be a reason for joy. Fasting had also become an expression of Pharisees’ devotion to ceremonial law, incompatible with the new covenant Jesus brought. Rote fidelity left no room for love and forgiveness. When we're spiritually dry, are we content in our relationship with God because we "keep the Law?" But fellowship with God is rooted in our faith in God's mercy, forgiveness, and faithfulness. When we're quiet, we know that despite our efforts we still sin. We can respond by working harder to build the façade of righteousness or yield to the Spirit and allow God's grace to transform us. Surrender to God gives us restoration; it transforms living in the Spirit from an obligation to a joyful way to live in Christ. In the US, Pope Francis spoke about him twice. One Bread, One Body: "Patch-work": Our lives are sometimes pictured as a fabric, of family, friends, work, finances, social life, habits, entertainment, service, etc.. When we give our lives to Jesus, he sews unshrunken cloth. As the patch shrinks, it stretches the other parts of the fabric of our lives. We need to be willing to be stretched and transformed, or else life in Christ will tear us apart. When we give our lives to Jesus, he'll make us fruitful, and that will change our social life, distract us from our distractions, and stretch our finances. The patch either tears up our lives or becomes our lives. If we're clothed with Christ, we're clothed with humility, power, mercy, kindness, and patience. May the patch of Jesus become your entire life. DailyScripture.net: "Fasting or feasting?" Fasting, prayer, and almsgiving were the three most important religious duties. 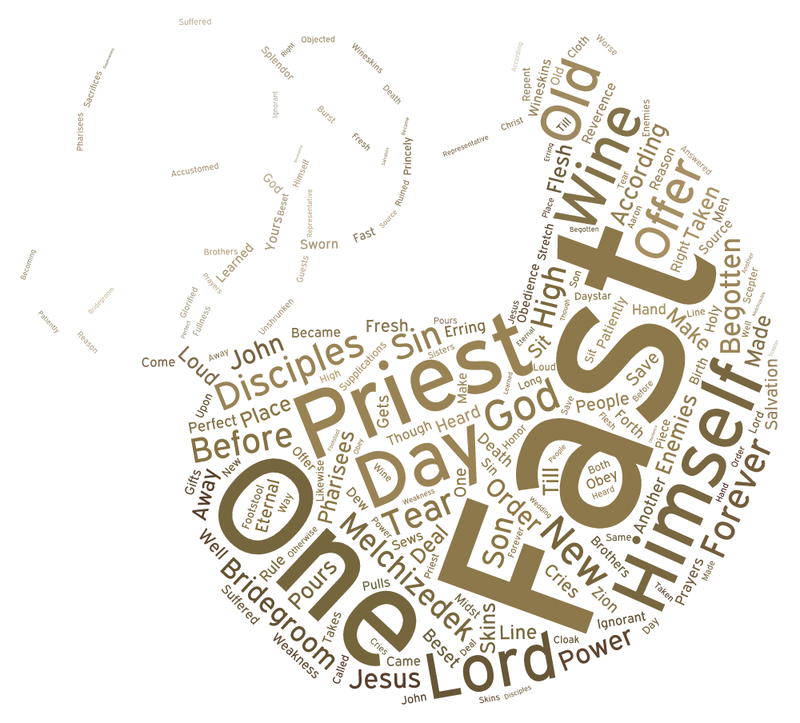 Jesus explained there was a time for fasting and a time for celebrating. To follow Jesus is to experience a joy like the wedding party's. But there also comes a time when we must bear the cross. Do I take joy in the Lord's presence and express sorrow and contrition for my sin? Using the familiar image of wineskins, Jesus warns against having a closed mind. New wine poured into skins is still fermenting. New skins were elastic enough to take the pressure, but old skins burst. There's a right place for the old and for the new. Jesus says the kingdom is like a householder who brings out both the new and the old. The Lord gives us wisdom so we can make the best use of both the old and the new. He wants us to be open and ready to receive the new wine of the Spirit.